Plate birdfeeders are made from recycled plates. The hangers are copper with green verdigris added - and a marble at the top end.. The vines are also copper wire. The flowers and leaves are fashioned from broken bottles and vases. 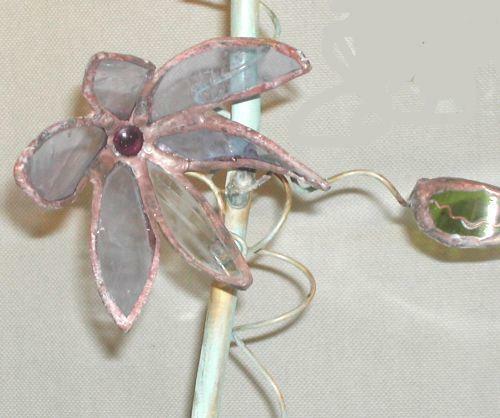 The pieces are shaped and put back together as flowers using copper foil stained glass techniques. The green leaves are pieces from wine bottles. Availablity of styles and colors of flowers depends on what I obtain from garage sales and flea markets. Regular versions are made from dinner-size plates. Smaller ones are made from dessert-sized plates. There is some variation in size. + shipping/handling ranges from $14 to $20. The flowers are made from broken pieces of bottles or vases.